— Emeryville, Ont. : Biblioasis, 2008. In A Report on the Afterlife of Culture, one of Canada’s most provocative writers ranges across continents, centuries and linguistic traditions to examine how literary culture and our perception of history are changing as the world grows smaller. Weaving together daring literary criticism with front-line reporting on events such as the end of the Cold War in Poland, the plight of indigenous cultures in Mexico, and Guatemala, and African reactions to the G8 Summit, Henighan evokes a world where astonishing cultural riches flourish under siege from all-consuming commercialized uniformity. 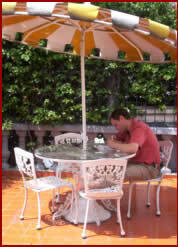 Whether illustrating in irreverent detail the reasons for the popularity of Ian McEwan’s Atonement, providing authoritative accounts of the work of writers such as Gabriel García Márquez, Alice Munro, Haruki Murakami or José Saramago, writing with fresh insight on Cuban literary politics or the practice of literary translation, or intervening with forceful clarity in debates about the Giller Prize, book reviewing or Margaret Atwood’s LongPen book-signing technology, Henighan is equally engaged with the word and the world. The work of a writer whose vision is simultaneously local and global, A Report on the Afterlife of Culture is entertaining and essential reading. Intricate and tightly coiled explorations of the questions plaguing literature in a globalized world….. Henighan’s readings are virtuosic, and his delicately constructed discussion of the problems of translation underlines the reciprocal relationship of language to culture. Literary criticism in Canada suffers from a plague of timidity…Our Canadian politesse, which finds any kind of negative or contrarian opinion to be in poor taste, encourages this kind of criticism. We prefer cheerleaders to critics. Fortunately, Canadian criticism can boast Stephen Henighan, a persistent thorn in the side of the Canadian literary establishment, but also a fearless and perceptive observer of our culture. Henighan’s criticism is not of the Dale Peck school of unthinking snark. He prefers a careful reading of texts and authors, and a deliberate analysis of how cultural forces in our society shape the kind of literature we produce. When Words Deny the World, Henighan’s 2002 essay collection, argued that a “free trade” mentality among publishers, writers, and agents has resulted in a flattening of our literary landscape and an ahistorical approach to the themes and subjects of our fiction. His new collection extends this thesis. 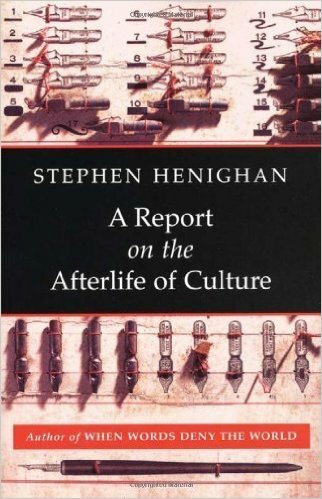 A Report on the Afterlife of Culture is larger than its predecessor in every way: it is longer, and its range of focus has broadened to include a section of essays devoted to the work of international writers….for his willingness to say the unsayable, and his enthusiastic piercing of the balloons of Canadian literary pretension, Henighan’s new volume is a welcome addition to the annals of CanLit criticism. One of the strengths of this book is Henighan’s global connections. He is well travelled as well as well read. A Report on the Afterlife of Culture speaks to a global audience (while maintaining the local specificities of its Canadian roots, of course). I don’t know of another recent book of Canadian literary criticism that accepts the challenge of globalisation (globalization? ): both the economic and the cultural streams. Henighan treats CanLit within the context of WorldLit. Stephen Henighan, who is one of Canada’s leading literary provocateurs, returns with this lively collection of essays, columns and reviews challenging the cultural establishment…Whether in his sweeping, historical “Report,” or in his appreciations of international authors, or commentary on the Canadian scene, Henighan is always worth reading. Disagreeing with his many controversial opinions is half the fun. The noted Geist writer has compiled a nice little bundle of rants, many of which are not attacks on Margaret Atwood, for which he seems to be most famous. If you are one of those people who can read non-fiction in the summer, please attempt this much-needed critique of Canadian culture. Then maybe we can all get together as Canadians and agree to start having more fun, instead of writing books about vast fields of snow and falling in love with animals. There are problems with Canadian literature, not the least being the undue praise of mediocrity. Henighan does us a service by raising this and other contentious issues. These pieces provide a demonstration of Henighan’s vast reading of Canada’s and the world’s literatures and languages….. This book both reiterates and furthers many of the debates that have made Henighan a noted figure in Canadian literary circles. A Report on the Afterlife of Culture, including both its main essay and its smaller skirmishes, is a welcome addition to the undernourished culture of critical books in Canada.